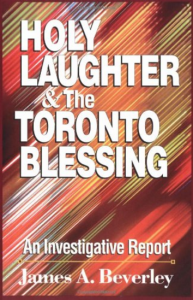 This is a 1995 Zondervan book that investigates the recent “Holy Laughter” phenomenon. Beverley is professor of theology at Ontario Theological Seminary in Toronto. His report is not as doctrinally precise as John MacArthur’s or as antagonistic as Hank Hanegraaff’s and, in my opinion, not as Scripturally weighted as it needs to be. Beverley, though a Baptist, sympathizes with most present-day charismatic phenomena. He is not quick to dismiss even this laughing phenomenon as unscriptural. He does, to his credit, make much effort to investigate reports of what happens in these services and includes a number of critical remarks directed toward the whole Vineyard movement.